A dissolution system is the next step for any lab increasing testing output or wanting to streamline and automate sampling analysis. The two most common types are offline (fraction collector sampling) and online (built-in UV spectro-photometer analysis). Offline is perfect for automated sampling from the dissolution tester into HPLC vials, which you then transfer to the HPLC for analysis once the sampling is complete. The sample points can run over any time period and once initiated, require no further intervention until the test is over. Online is ideal if you require inline sampling of the test media without the need to collect samples and transfer them to anther device, such as an HPLC. In an online system, the UV extracts the sample, analysis it, records the result and returns the sample back to the dissolution tester. Once the test is over, the results are already recorded and nothing more needs to be done. It is also possible to have a combined On/Offline system, where you can extract samples for HPLC testing using a fraction collector and also run inline UV analysis at the same time, during the same single dissolution test. TLS can provide the above systems to your requirements, with or without CFR compliant computer software . If you don’t want the software, our Offline system doesn’t even need a computer to run properly – it is all controlled form a simple panel on the dissolution tester itself. The systems are set up by ERWEKA, and then installed at your site at a time to suit you. 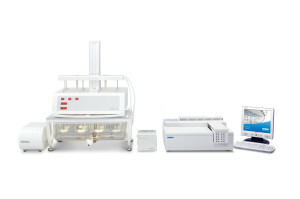 If your lab finds manual sampling is no longer quick enough or reliable, or isn’t suitable for your test methods/compliance regulations, or perhaps your workload is now much busier, a system might provide you with the solution. To find out more about the high quality, automated ERWEKA dissolution systems that we can provide, please use the following links.